English marine and topographical painter and etcher. 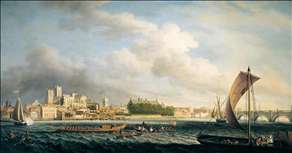 He began as a marine painter in the tradition of the van de Veldes, but he turned to topographical views in the manner of Canaletto, who was then enjoying great success in England. 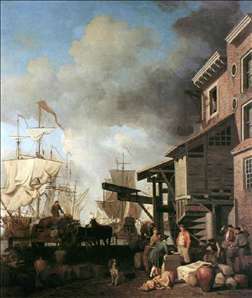 He was not simply a mechanical imitator, however, and had a feeling for the English atmosphere that is lacking in Canaletto, who brought the Venetian light with him to England. 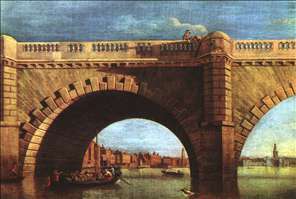 Scott also could achieve a distinctive grandeur of design, as in an Arch of Westminster Bridge (Tate Gallery, London), which is often considered his masterpiece. He left London in 1765 and settled in Bath for reason of health, evidently painting little in his later years. See more details about "The Building of Westminster Bridge"
See more details about "Part of Old Westminster Bridge"
See more details about "The Thames at Westminster Bridge with Barges"
See more details about "A Thames Wharf"